Construction This wedding album incorporates a genuine leather cover which is debossed with your specific wedding date and names. The 24 acid free archival quality pages come with your selection of double cut mounts, black on white, or white on black. 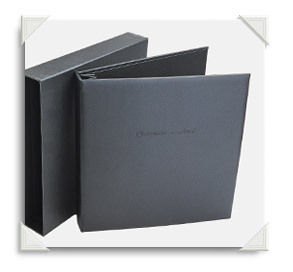 This wedding album comes with a buckram covered slipcase to protect your album. The album is made from the highest quality products available, which gives the total package an elegant finish.